The Andalusian province of Granada, with its capital city of the same name, is a region of contrasts. From skiing in the Sierra Nevada National Park to diving in the Mediterranean; hiking in the mountains to walking in underground cave dwellings; or immersing yourself in Moorish history to sampling the Arab influenced cuisine – there is certainly something to attract all ages to this region. The province of Jaén, known as the gateway to Andalucia, is situated north of Granada and is Spain’s biggest olive oil producer with its landscape covered with row upon row of olive trees. It is also filled with heritage and ancient culture and is renowned for its castles and battlegrounds which form part of its long history. Some of the country’s most important fortresses can be found in this region. On arrival at Malaga airport, collect your hire car and self drive (1 hour 30 minutes) to the Hospes Palacio de los Patos in Granada. This is a true grand hotel with elegant gardens, a very sophisticated spa with thermal bath, a fine dining restaurant with terrace and a peaceful and relaxing environment in spite of being in the centre of a city. Valet parking costs 26 Euros per day (payable locally). No visitor to Granada should leave the city without having visited the world famous Alhambra Palace and Generalife Gardens. Evidence from old Arab texts indicate that construction within the Alhambra dates back to the 9th century, or possibly earlier. The summer home of the Nasrid Kings was constructed during the 13th century and today is one of the most visited monuments in Spain and a UNESCO World Heritage Site. Divided into four main areas – the Palaces, the Alcazaba, the Medina and the Generalife Estate - either a full morning or afternoon visit is recommended to really appreciate this wondrous monument. The Palace complex is reachable on foot (1.6km from the hotel) or by public transport. Due to its popularity and limited visitors per day, it is recommended to book visits to the Alhambra in advance (open all year except 25 December and 01 January). Sunvil includes the price of the entry ticket in this itinerary. Granada is a mix of heritage and culture and this can still be seen today in the different neighbourhoods. 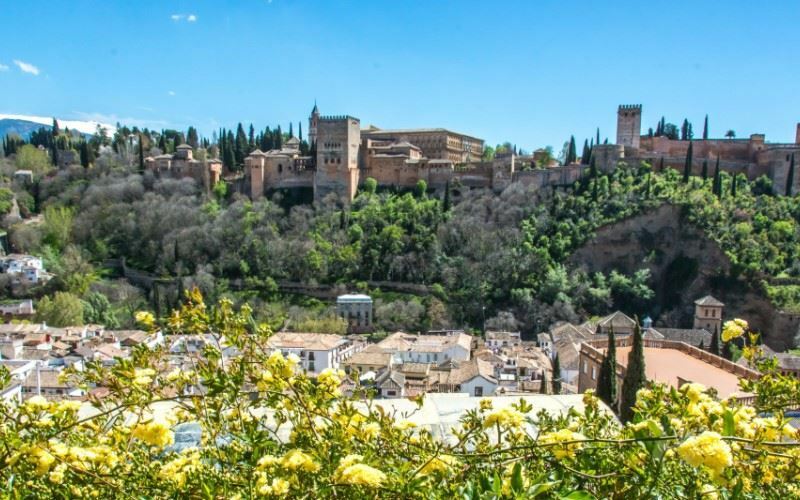 The bustling old Arab quarter of Albayzin, a UNESCO World Heritage Site, stands on a hill opposite the Alhambra and here is where you will find a labyrinth of narrow streets, Mudejar towers, remains of Mosques and minarets as well as pretty squares. There are also two great viewpoints in Albayzin - the churches of San Nicolás and San Cristóbal. The old gypsy quarter of El Sacromonte, on the Valparaíso Hill, is where you will find the caves in which singing and ‘Zambra’ – a flamenco dance - have taken place for centuries and today, where traditional shows take place for visitors. The Sacromonte Abbey can be found at the top of Valparaíso Hill. The old Jewish quarter of Realejo is a lively residential area popular for strolls and for watching the world go by whilst enjoying some tapas. The imposing fortress of La Mota in Alcalá la Real sits high on a hill and is worthy of a visit. Inhabited since the days of Muslim rule, the fortress includes the archaeological remains of the ancient town and many historic buildings. Alcalá la Real falls within the province of Jaén but is located between Granada and Cordoba, approximately an hour’s drive from Granada. After breakfast, drive to the Parador of Úbeda (1 hour 40 minutes). Originally a palace, the Parador, which opened in 1930, is an ideal base from which to explore Úbeda and the province of Jaen. Within you will find comfortable rooms and a beautiful courtyard typical of Andalusian palaces. The World Heritage city of Úbeda has an array of historical buildings which include palaces, churches, an old synagogue (discovered by chance during building works and restored between 2007-2010), the hospital of Santiago, the Salvador Chapel and the exceptional square of Vazquez Molina with its impressive buildings and which is where you will find the Parador. Sunvil recommends a visit to the World Heritage city of Baeza which is situated a short drive away (15 minutes) from Úbeda. Baeza, is much smaller in size but like Úbeda was renovated in Renaissance style during the 16th century and it is unheard of to visit one but not the other as they really do complement each other. Highlights of the city include the Plaza de Leones, a cobbled square surrounded by Renaissance buildings, the Palace of Jabalquinto, the Cathedral and the old university where the Spanish poet Antonio Machado taught French for many years. The city of Jaen, located an hour’s drive away from Úbeda is rich in heritage and has the best preserved Moorish baths in Spain. Built in the 11th century the baths can be seen in the basement of the Villardompardo Palace (closed on Monday’s). The magnificent Cathedral, in Santa María Square, is a masterpiece and home to a relic of the Holy Face of Jesus - the Veil of Veronica. The Arch of San Lorenzo – the only remains of the old church of San Lorenzo and the Basílica Menor de la Sacra Iglesia Parroquial de San Ildefonso, which dates back to 1248, are two other highlights that can be seen, in a city which comes alive during the week but tends to be quieter on Sunday’s and public holidays. On the highest hill in Jaén, the fortress of Santa Catalina was built by the Moors to guard over the valley below. During 1246, after being conquered by Ferdinand III, King Aben Alhamar of Arjona peacefully handed over the fortress and it is here where you will find the ruins of the Castle of Santa Catalina (open daily for visits except on public holidays – payable locally). After breakfast, drive to Malaga airport (2 hours 50 minutes) for your return flight to the UK. The elegant 5-star Palacio with alabaster white interiors is centrally located in the historical and financial heart of Granada with shops and restaurants in the immediate vicinity. The elegant 5-star Palacio with alabaster white interiors is centrally located in the historical and financial heart of Granada with shops and restaurants in the immediate vicinity. The Alhambra Palace which is on the edge of the city is a 25 minute walk. The hotel is composed of two buildings, the 19th century Patos Palace, a majestic, historical and cultural building which has been sensitively restored and an elegant new building opposite, set behind alabaster latticework. This is a true grand hotel, with elegant gardens, a very sophisticated spa with thermal bath, a fine dining restaurant with terrace and a peaceful and relaxing environment in spite of being in the centre of a city. On one of the most impressive and monumental squares to be found in Andalucia, the Plaza de Vazquez Molina stands the palace of Dom Fernando Ortego Salido, the 16th century Dean of Malaga. On one of the most impressive and monumental squares to be found in Andalucia, the Plaza de Vazquez Molina stands the palace of Dom Fernando Ortego Salido, the 16th century Dean of Malaga. The exterior facade hides a beautiful inner courtyard, typical of Andalusian palaces, with a double gallery, the upper section of which is glazed and from which the bedrooms are accessed. The upper section of the gallery is reached by a very grand staircase from the reception area. The palace was altered and renovated in the 17th century and was opened as a Parador in 1930. Further restoration was carried out subsequently. The bedrooms are large and comfortable with decorated ceramic tiles and antique furniture. The dining room is furnished in typical Andalusian style and cuisine is both international and regional. This is a very special Parador in a fascinating city, close to craft shops, cafés, restaurants and tapas bars. 36 air-conditioned rooms including standard rooms, superior rooms and a junior suite. 20km from the Train Station. Places of interest nearby: The Cazorla Natural Park; and the Graja Caves, in the village of Jimena, to look at the interesting prehistoric paintings. The festival of San Miguel is held each year in Ubeda from 28Sep-04Oct and in late May to early June there is an International music and dance festival.